If you are a looking for a wonderful Thai flavored noodle dish, look no further. 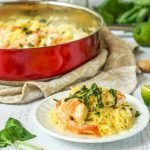 This coconut basil shrimp spaghetti squash recipe is full of flavor, low carb, gluten free and only takes about 20 minutes to make! In a large saute pan, melt the coconut oil and then add in the crushed garlic and grated ginger. Mix for a minute until fragrant. Add in the shrimp and saute for a minute to coat with the spices and then add in the coconut milk. Once the pink just start to get pink (only a few minutes) add in the spaghetti squash and half of the basil. Mix and cook until the shrimp is cooked all the way through. When done, toss with the lime juice and remaining basil and serve.